This cookbook is a great tool for any home. I use it often as a starting point for many dinners. It’s one of the few cookbooks I actually use! Most of the time, I just use the internet. But there is something old fashioned and comforting about pulling out a cookbook. Don’t ya think? Anyways, I found a recipe in there for Chocolate Revel Bars and instead of completely following directions, I changed it up. By adding more chocolate (and butterscotch), of course! Do you have a favorite cookbook that you use as a standby? Or do you use the internet? Or, are you just an amazing cook who can throw things together from scratch? 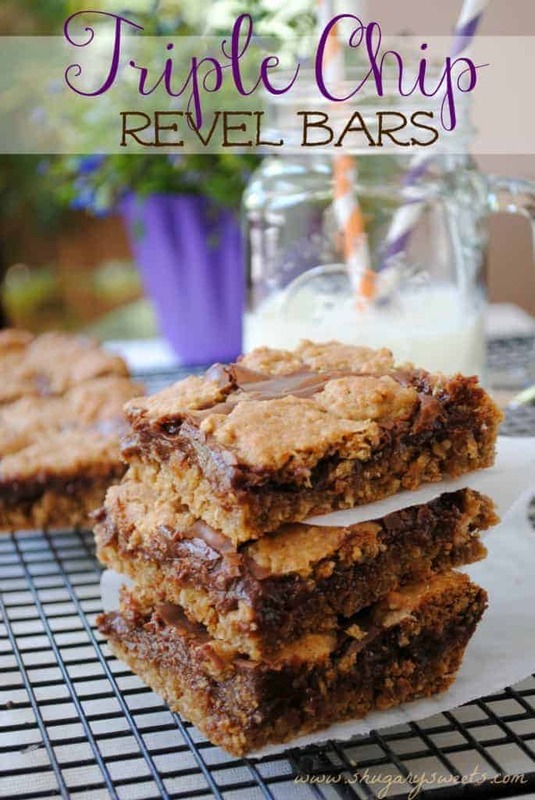 If you enjoyed these Triple Chip Revel Bars, you may also enjoy these recipes…. Triple Chip Revel Bars: sweet oatmeal cookie bars with a fudgy center! Beat all but 2 Tbsp of softened butter with brown sugar. Add baking soda, eggs and vanilla extract, beat until combined. Add flour and oats. In a small pan, heat the milk over low, stirring constantly. Add in butter and all the morsels. Continue to stir on low heat until everything is melted and smooth. Remove. Press 2/3 of the dough into bottom of an ungreased 15x10 baking sheet. Keep pressing with your fingertips, it all fits, honest! Pour chocolate sauce over dough, spreading evening. Drop remaining dough by teaspoon over chocolate sauce. Bake in a 350 degree oven for 25-28 minutes. Cool and cut into bars. ENJOY! I have that same cookbook – I got it for myself as soon as I got married because my mom had it and I’d used it my whole life! It’s such a great one. Now, my go to cookbook is Pinterest, lol. And, my blogger friends. 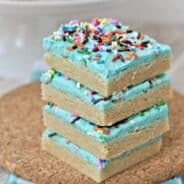 🙂 These are awesome bars! Great for the holidays! Wow! The picture looks amazing and the bars look finger licking good. I usually use the internet for my recipes. It is faster and easier to find recipes. I love how much chocolate is in this and the condensed milk added in this makes it sound so decadent!! How I wish I could grab a bar right now! How I wish I had some left to grab!! haha! I have that same Betty Crocker cookbook and it is still one of my favorites. 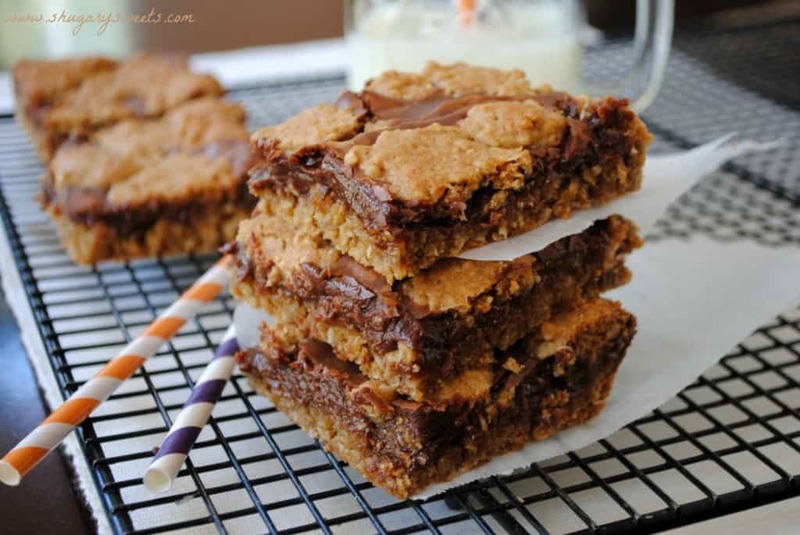 I love these bars–especially with the butterscotch chips. YUM. Thanks Ashley! I try to sneak butterscotch in every change I get. LOVE it! I need these. Like NOW. I swear they would last maybe 1/2 a day in my house. And that’s just with the kids eating them. Those look WONDERFUL!! I’ll trade you my Chocolate Shortbread Pumpkin Malt Ball Bars for these. Mmmmm! And yes, I love my older cookbooks. I need to find those Pumpkin Malt Balls. Stat! I have that cookbook too…from a wedding shower:-) There a few recipes in it that I always use! 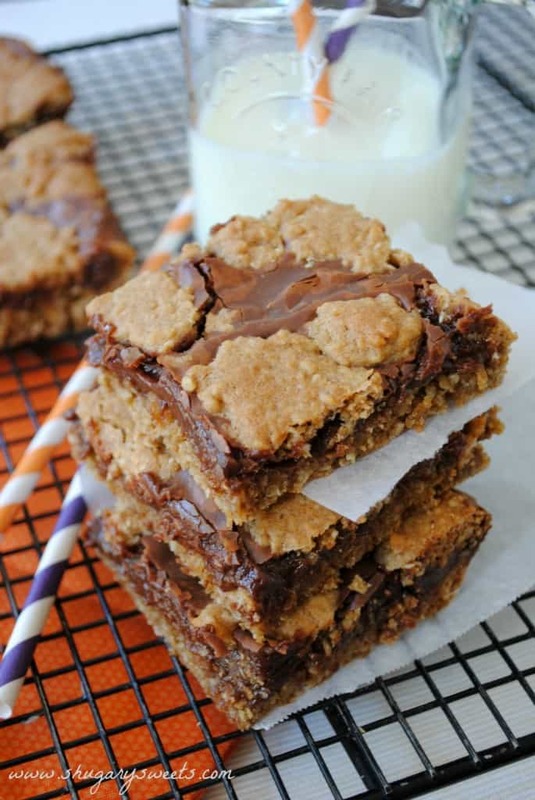 Love that you added more chocolate and butterscotch to this awesome bar! Ugh, these look so delicious! Why do I not have a pan waiting for me here so I can scarf them down? I agree with you on the whole cookbook thing. I recently pulled mine out when my power was out and completely forgot how wonderful it is to cook from a cookbook. I miss it. We should all do it more. Butterscotch makes everything better. Right? For Christmas baking I usually ask my mom for all of her recipes as they bring back so many childhood memories. I’m not the kind of person to just whip something up from the top of my head. You bars look delicious, love all the chocolate! These bars look oh so decadent, Aimee! I have that cookbook too and LOVE it! It is a classic in my opinion! Thanks for stopping by Hayley! Gosh, I really really love chocolate. These look SO good, wish I could have one like right now! Cookbooks are my fav but I seem to be using the internet more and more. 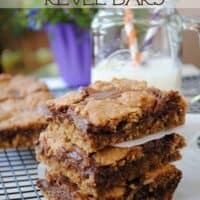 Man I love revel bars, so easy and so good! Love the butterscotch chips in these! My go to place for recipes has been the internet with the exception of my King Arthur baking cook book! I LOVE King Arthur’s cookbook!! Thanks for stopping by Tanya! Thanks Aya, it’s a pretty amazing bar! Sooo yummy! There aren’t words for how delectable these treats look! Awww, thanks Kayle! Wish I had some left to share! Yes, yes, and yes!! Will be making these (in addition to your cake!! )… We’ll be married 17 yrs next summer. Goes soooooo fast, I know! I used to make these bars all the time when I was a kid! The summer before middle school, my best friend used to have sleepovers at ny house almost every night, and we would make these bars. Our version was butterscotch chips, milk chocolate chips, and chopped pecans instead of dark chocolate. They were so good! Aimee, what if I don’t have that large a pan? Can this be made in s smaller quantity? Hi, I just want to let you know that it’s absolutely delicious. 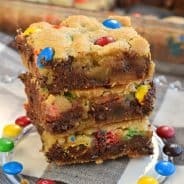 I’ve been making revel bars for a year now and my mom extremely loved this recipe. She was able to finish a whole pan in 3 days! Thank you! I have that same cookbook, except mine is much older than 17 years and got it as a wedding gift as well. I love using it and it’s probably one of two that I do…the other is one that I bought from some college kid selling them (door-to-door) and I was a sucker for it. The buying pitch was…it had over 1,000 chicken recipes! haha! I will have to look at my Better Homes and see if this recipe is in it. Yes, I do believe these bars will be made soon and feel confident I will be using the elliptical twice as much! I pinned it and I will definitely make them! 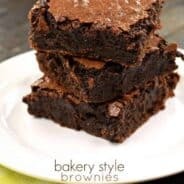 I’m thinking these are the perfect after school treat! Yum! I got a Betty Crocker cook book in 1958 when I got married, Everything I learned to cook came from that book, it is in pieces but I still look things up sometimes. I keep saying should buy a new one. Loved that book. Revel cookies are the best. That’s so awesome. Sometimes when a cookbook is done right, there’s no need to replace it. Betty Crocker did it right!